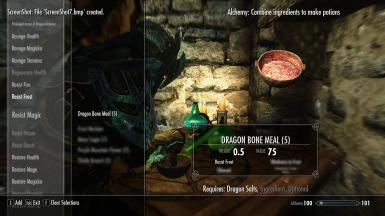 Allows the character to use dragon bone and dragon scale along with some typical items that have little standard use to produce some dragon based ingredients for alchemy. These ingredients can be used to mix some new potions with both typical and more distinct effects. For example, you can craft a potion to Become Ethereal. This mod contains files, specifically meshes and a few textures that are modifications from Brumbek's SMIM mod. These have been used with the gracious permission of Brumbek. See the primary information on this mod for a listing of files derived from Brumbek's files and files originating from this mod. Any files derived from Brumbek's files should only be redistributed with that users permissions despite any further modifications that may have been made for this mod. Any files listed as originating with this mod do not require permission or credit. Special thanks to Brumbek for allowing this mod to use some of Brumbek's SMIM meshes for ingredients and a related texture or two. If you aren't familiar with SMIM you should check it out. Any aesthetic faults in the meshes or textures of this mod are almost certainly my own. Ever imagined to what good use you could put all the clothes irons you find? Maybe you imagined using them to smash Lydia's kneecaps until she stopped standing in the doorway. This isn't "that” mod. With this mod take those clothes irons and make some use of them to gain some unique alchemy ingredients and effects. Not just clothes irons. You have all that dragon scale and dragon bone and so few people that want to buy it and those that do may not have a lot of coin. You are the Dragonborn and you produce dragon remains faster than the market can absorb them. By the Gods, if you are level 100+ smithing and can create Dragon Armor I bet you still collect more smelly dragon remnants than you can do away with. Thus was born Dragon Alchemy. 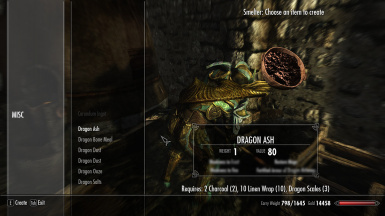 With Dragon Alchemy you can take dragon bone and dragon scale to your favorite smelter location and combine it with other materials that have no use or little value to create the new ingredients of Dragon Ash, Dragon Bone Meal, Dragon Dust, Dragon Ooze and Dragon Salts. It will have you asking yourself "Why didn't I pick up those spigots?" These new ingredients have some worth on the market but their best use is in Alchemy. Combine these ingredients together with one another or with other standard ingredients and get some nice effects. See the section below marked off as a spoiler area for the list of effects. **See Page Change Log section below for information on major page edits. Unlike version 1 of the mod there is an economic gain when performing each step. Both smelting raw materials into ingredients and combining ingredients at an alchemy table will produce a result of greater value than the raw materials. The amount of gain for the smelting process will be on average about 2x the value of the raw materials. For the resulting potions the value gain will be dependent on the magnitude of the potion effects which depends on alchemy skill and other boons while performing the alchemy; thus, potions can range from 2x-20x in value of their raw materials. The following are the smelter recipes to create ingredients the (xN) beside the smelting product name is the quantity produced for the recipe under it. Because those are a lot of recipes and you may not wish to see them all in your MISC menu section when at the smelter I have added an MCM menu. In the MCM menu select then Dragon Alchemy menu screen. 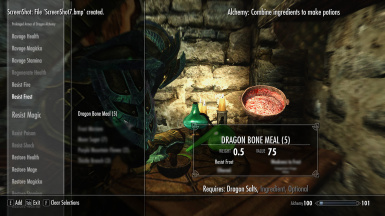 You will see a single option - "Show all dragon alchemy recipes" by default it is marked as enabled. If you un-mark this option you should no longer see the recipe at the smelter unless you have the materials to use the recipe. You can also set the GlobalVariable - YofisuListAllRecipes to 0 for false/unchecked or 1 for true/checked. Ingredient effects can be found in this forum thread with a sticky post. 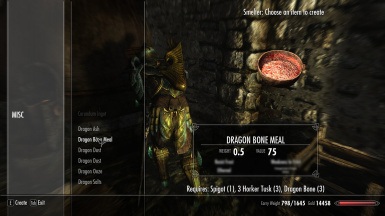 The version 2 of this mod (the current version) has no changes to the base potion effects created or recipes but there are some changes in recipe magnitudes and values. --The negative effect potions have had their negative effect magnitudes shifted downward as compared to v1. This is because they were much higher than desired at high levels. --The values of the potions have been shifted upward significantly so that now you can make some decent coin if you were to actually resell them. Recommendations for alternate effects, magnitudes and durations on these effects at any or all skill levels or recipe changes for ingredient production are very welcome. Since the order of the effects for an ingredient may impact some folks more than others, especially depending on how you use perk points in your alchemy tree when it comes to tasting ingredients or getting a pure poison or pure potion please comment if the effect order gives you an undesired result. That outcome of mixing a potion can depend on variables where my testing samples may not have hit on a range that give the results you encounter Since there are multiple inputs that can slide in power across a wide range there is a lot of room for differing outcomes. The resulting potions should be along a range of results in all cases but there is always a possibility that a unexpected result occurs. I tried to cover the bases up through Alchemy skill 199 and about 100% additional boon on alchemy results. Any feedback on how you would like it differently balanced is encouraged. A proper balance is a very difficult thing and also a bit subjective. What feels nerfed for one may be OP for another. Thus feedback is encouraged. The script file is there only to create the MCM menu. No conflicts with other mods are known. If using ReProccer or T3nd0s Skyrim Redone then I suggest you place this mod before those mods or similar type mods in your load order. 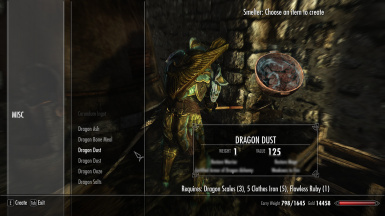 This mod uses a number of standard effects so anything that changes the behavior of potion or magic effects may change the effect of these potions. I have not tested when using Immersive Poisons for SkyRe as it has only been out since 4 Sept. 2014 and I just recently became aware of it. 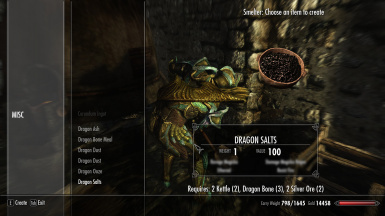 As soon as I can put together a Skyrim instance with SkyimRe and Immersive Poisons for SkyrimRe I will test the default outcome of Dragon Alchemy when used with these two mods. Special thanks to Brumbek for allowing this mod to use some of Brumbek's meshes for ingredients and some related textures from the SMIM mod . If you aren't familiar with SMIM you should check it out. Any aesthetic faults in the meshes or textures of this mod are almost certainly my own. All other files not attributed in the preceding text are the full rights of the user Yofisu and the use of these files are granted unconditionally without need for credit or permission.